But first...what does a steamer do? Exactly that - it steams, duh! All kidding aside, a commercial steamer creates this steamy environment that allows heat to be transferred from the steam to the food. The steam acts as a vehicle to move its heat throughout the chamber, and once it loses its heat it is either captured in a drain (in the case of a boiler-based unit) or recycled within the unit (i.e. a boiler-less model). The progression of steam technology over the years has given end users with limited kitchen space accessibility to its stunning versatility. That being said, there's absolutely nothing wrong with going the route of a more traditional, boiler-based commercial steamer that requires water and drain line hook-ups. That's precisely the reason we're writing this blog. As many steaming options as there are out there, we're here to help you evaluate your kitchen's steaming needs by whittling down the vast world of commercial steaming technology. From boiler-less units with smaller footprints to high-performance, à la carte units with some power in their britches, no matter what your operation or needs may be, there is a steamer for everyone! 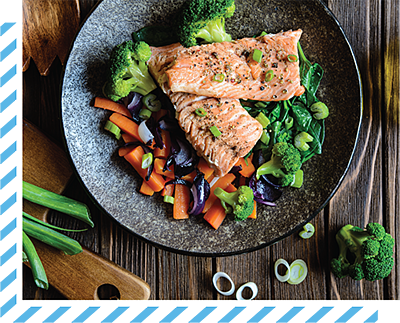 Like we've already noted, commercial steamers are full of benefits that facilitate in any type of foodservice operation. Finding the right steaming unit for your operation can be a bit overwhelming, so we've created a cheatsheet for you discover the perfect solution to your kitchen! 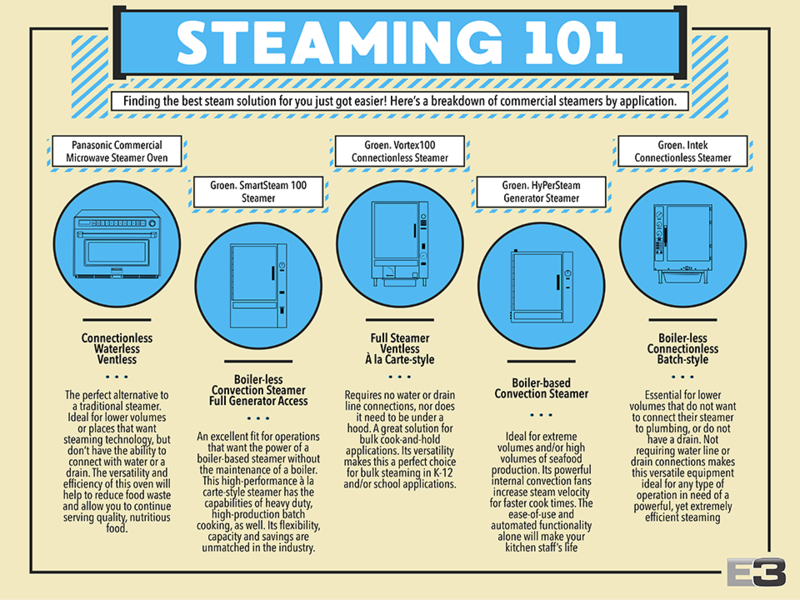 This breakdown gives you a good idea of not only the different types of steamers out there, but the types of application they thrive in. For example, the Panasonic Commercial Microwave Steamer Oven is the epitome of flexibility. This is every ventless/drain-less kitchen's dream and should exist in every type of kitchen, especially those with limited accessibility. But, when it comes to commercial steamers the fine folks at Groen know a thing or two about steaming. If you couldn't tell by their name plastering our sheet, they have created a solution for just about every steaming application imaginable. From high-performance beasts that make high-volume operations look like a picnic to incredibly versatile and easy-to-use units that will make you wonder why you haven't been using it all along. Like we've been saying, there's a commercial steamer out there that is perfect for just about any operation; its versatility is what makes it such an amazing piece of technology. It's just a matter of finding which one is the right fit for you! One of the many perks of giving food a nice shvitz in a commercial steamer is retention: not sacrificing those wonderful vitamins and nutrients packed inside during the cooking process. As we already unwrapped, steam is the vehicle within a steamer for which heat can move around and evenly cook the food. This gentle approach not only allows those nutrient-rich items to keep their healthy attributes, but you can kiss fats goodbye as they melt away in the cooking process. Harsher, more direct cooking methods (i.e. grilling or broiling) usually come to mind when wanting to render away fat. But, with that high direct heat comes the loss of healthy nutrients. Utilizing steam gives you nutritious food in the leanest form possible. To pile on the health benefits, steam cooking doesn't require any oils or butters to be used in its cooking process - health yes! But, don't panic over losing those flavor elements that come with those fatty-rich ingredients. Break out those seasonings and harness your creativity with more health-conscious flavors. Health isn't just evaluated on the micro-level. You want the food to look as good as it tastes. To parlay with the steamy environment being created, the steamer also teams up with food's moisture content and natural composition. Bringing these elements to the surface not only aids in the cooking process, but it makes them look their best. The natural moisture in chicken can make them more plump. 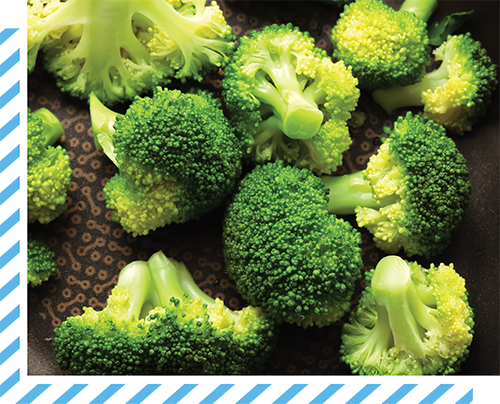 The chlorophyll in broccoli will shine bright green. Anything helps in getting people to eat healthier, and this is a leap in the right direction. If we haven't gotten you excited about how your operation can benefit from a commercial steamer so far, then hear us out. Whether it's a connectionless model or a boiler-based model, commercial steamers are extremely efficient. 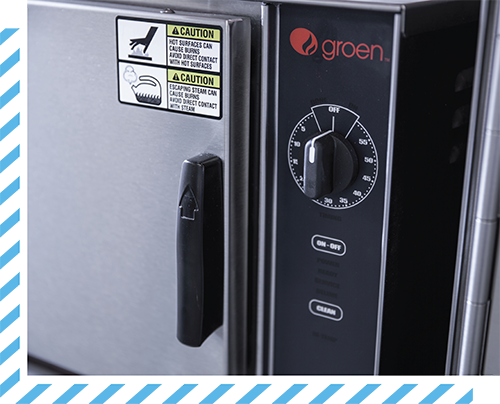 Get faster results than most traditional cooking methods in a less harmful environment. Aside from being the healthiest style of cooking, steamers provide the ultimate solution for flexibility and productivity in school foodservice operations. Imagine having the ability to cook foods from frozen without having to worry about risking the quality of the food you're serving! Not to mention vastly reducing your food waste. And to top it off, this is all happening in a fraction of the time it takes various other traditional cooking methods. It's tough to compete with the long list of benefits to steam technology. Now, if all that isn't doing it for you, then we may have a more serious problem on our hands!